This document outlines the general layout of the CRM. The CRM can be accessed via crm.prospect365.com. Once you have accessed the CRM you will be greeted with the dashboard screen as shown below. The main section on the bottom displays a collection of dashboard reports, these can be configured depending on what type of information you want to be displayed. To open these reports & view more information click on the report tile. Below the reports you then have a News section highlighting information about the Prospect 365 CRM. Next to this you have the Tasks list which displays all of your current, overdue & upcoming recalls. Finally, you have the Recent Activity listing all CRM records & reports that you have recently had opened. This section is helpful when needing to navigate back to previously opened records. On the right-hand side, you have the search functionality and the create new record ability, shown by the + symbol. Selecting the + symbol opens a drop down which shows the different types of records which can be created. This is particularly helpful if you need to create a record quickly & don't want to find the parent record first. Records within the CRM can be assigned to users of the CRM by using the Recall functionality. Once a recall has been completed it can then be viewed from the Task Menu. 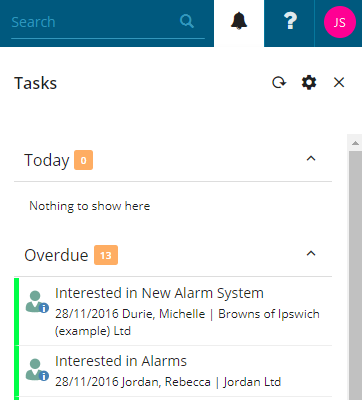 This can be accessed by selecting the bell icon shown above and will display tasks due today, tasks which are overdue and any upcoming tasks. You can also manually refresh your Task list, access the settings options and close the Task list by using the icons shown above. The Help Menu is accessed by clicking on the question mark icon shown above. Within this section there are several options to help with the usability of the system. This is located in the top right of the CRM, the icon above shows the user initials of the individual currently logged into the CRM. Selecting this icon allows you to view information about the profile you are currently logged into, alter settings regarding information which is displayed in the CRM, change the available language and also log out of the system. Each record in the CRM follows a similar structure to help you navigate and access information within it. The example shown below is for a Lead record but the same principles apply for other records in the CRM. The location of the record in regard to the hierarchy of the CRM is shown under the Lead description, clicking the Division, Company or Contact name will load up the corresponding record in the CRM. On the left-hand side of the record is a selection of tabs which relate to additional information relating to that record. In the example above these are; Addresses, Problems, Quotes, Documents and Related. To add information to a record simply type into the required section and the information will be saved automatically. If you want to create a new record against the one you are currently on simply select the + icon at the top of the record. This will give you a list of what can be created, click on the required option and it will open a new record ready for information to be added. To close a record simply press the X. This will close the current record and then display whichever record was previously loaded.